Possibly Mary B. Hazelhurst Mason. Acquired 24 February 1925 by Thomas B. Clarke [1848-1931], New York; his estate; sold as part of the Clarke collection 29 January 1936, through (M. Knoedler & Co, New York), to The A.W. Mellon Educational and Charitable Trust, Pittsburgh; gift 1947 to NGA. The provenance of this object is unclear. A circa 1954 note (in NGA curatorial files) includes it in a list of Clarke collection objects that came through the dealer Augustus de Forest and that bore false signatures in red paint; however, other Clarke collection records do not list this work as a de Forest painting. Further file notes indicate that it was "said to be from the collection of Mary Hazelhurst [sic], Westtown, Pennsylvania, a niece of the sitter," but again no evidence exists. There are also letters dated 9 and 27 April 1925 (in NGA curatorial files) from Mary B. Hazlehurst Mason of Westtown concerning her aunt (the sitter) to Charles X. Harris (Clarke's agent), but their content concerns genealogy rather than purchase arrangements. A Loan Exhibition of Paintings by Early American Portrait Painters, The Century Association, New York, 1928, no. 19, as by Thomas Sully. Portraits by Early American Artists of the Seventeenth, Eighteenth and Nineteenth Centuries, Collected by Thomas B. Clarke, Philadelphia Museum of Art, 1928-1931, unnumbered and unpaginated catalogue, as by Thomas Sully. Extended loan for use by The Supreme Court of the United States, Washington, D.C., 1971-1988. Extended loan for use in Chief Justice Rehnquist's chambers, 1986-1988. Extended loan for use by Ambassador Jeonnone Walker, U.S. Embassy residence, Prague, 1995-1998. A white ground of medium thickness was applied over the fairly rough, medium-weight, plain-weave fabric support. The painting has been lined. The paint was somewhat thinly applied but varies considerably, appearing very fluid in some areas and lean and particulate in others. The modeling of the sitter's hands, blended wet-into-wet, left a smooth surface, while brushwork is more visible in other areas of flesh such as the chest. The paint is in poor condition in much of the background and in the lowest areas of the sitter's dress, where it appears worn and there are scattered losses. These areas have been heavily inpainted. There are two inpainted lines of damage along the sleeve, another through the sitter's right temple and mouth, and many smaller inpainted damages scattered throughout the painting. The varnish is thick and has become considerably discolored. Portraits by Early American Artists of the Seventeenth, Eighteenth and Nineteenth Centuries, Collected by Thomas B. Clarke. Exh. cat. Philadelphia Museum of Art, 1928, unnumbered, as by Thomas Sully. 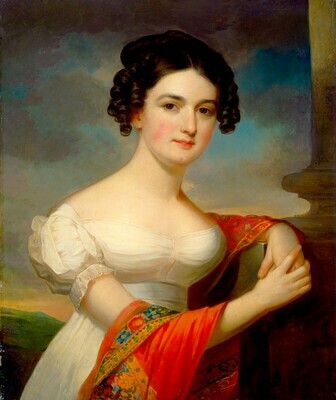 Beal, Rebecca J. Jacob Eichholtz, 1776-1842. Philadelphia, 1969: no. 337, 105. American Paintings and Sculpture: An Illustrated Catalogue. National Gallery of Art, Washington, 1970: 56, repro. American Paintings: An Illustrated Catalogue. National Gallery of Art, Washington, 1980: 153, repro. American Paintings: An Illustrated Catalogue. National Gallery of Art, Washington, 1992: 172, repro. Kelly, Franklin, with Nicolai Cikovsky, Jr., Deborah Chotner, and John Davis. American Paintings of the Nineteenth Century, Part I. The Collections of the National Gallery of Art Systematic Catalogue. Washington, D.C., 1996: 211-213, repro.